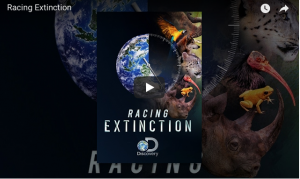 I was flicking through the Discovery Channel the other night looking for something to watch, when I stumbled on this documentary – Racing Extinction. It was heart rending, confronting, heart breaking and importantly, ultimately deeply motivating. An absolute eyeopener for me and left me looking for ways that I can lessen me and my families impact on the earth. If you are at all interested in understanding what effect humans are having on the rest of nature take an hour to watch this. Watch the intro below. It will change your world. Info on how to see the entire film is here. If you are interested in checking out Racing Extinction social media here are the links.